Not long time ago, a Nobel Prize was awarded to a U.S. economist who endorsed a “cashless society” as the most effective mode of business transactions. It is ironic that in Ancient Egypt, goods and services were being exchanged on the same cashless premise—by barter, trading goods and services without exchanging money. Barter (cashless exchange) requires that a medium object of an agreeable value be used as a measuring device of the exchanged goods/services. This medium can be anything acceptable to the parties of the transaction. Thus, the buyer and seller reckon the present market value of their goods against a third commodity of common use. In international trade nowadays, the medium commodity is gold, U.S. dollars, etc. No exchange of gold or dollars takes place between the parties, except maybe a small amount to adjust some slight difference between the values of the exchanged goods. For those business transactions that could not be achieved with barter, the Ancient Egyptians utilized coins. In Ancient Egypt, coins were used on a limited basis; mostly to pay off foreign mercenaries who could send the money to their home country or take it to their home country with them, where it could then be exchanged for goods and services. 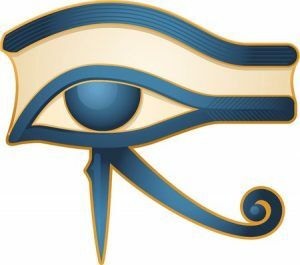 The Ancient Egyptian terms used for monies were also used for weights. Likewise, in present-day Britain, the term ‘pound’ means both a unit of weight as well as a unit of currency. We also find that the Hebrew word for money is shekel/sheqel, which is a slight sound-shift of the Egyptian (and Arabic) word of theqel—meaning weight/money. Coins in Ancient Egypt were made in the form of rings of gold, silver and copper, with specific weights certified by specialists. The word for ‘seal/stamp’ and ‘ring’ is the same, in the Egyptian language. All weights were measured and certified. Gold coins are found on the paintings from tombs during the reign of Twt Homosis III [1490–1436 BCE]. 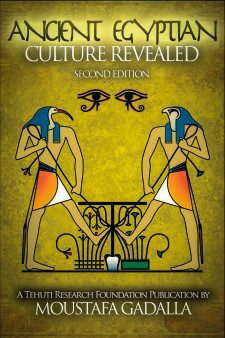 Documents were recovered from the times of Amenhotep II [1436–1413 BCE], showing that values of different articles were expressed in terms of pieces of metal—gold, silver, and copper – of fixed weight and value, which were used as means of exchange. Similar examples were recovered from the Ramesside times. 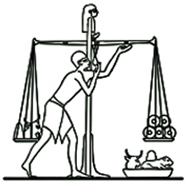 The concept of weighing was an important and common theme for the Ancient (and Baladi) Egyptian that extends to every aspect of life. Scales are found everywhere, from buying vegetables to representations of musical harmony, poetry forms, and the scale of justice that was depicted in the Judgment Day scene. Likewise, in our present time, the English word scale is used for weighing goods as well as in music (the musical scale). Depictions in Ancient Egyptian tombs show public weighers and notaries ascertaining the exact weight of everything they were called upon to measure in the public street or market, where they temporarily erected their scales. They were employed as governmental officials with the strictest regard to justice, without favoring either the buyer or seller. Official certification of weights in the marketplace. A scribe or notary is shown marking down the amount of the weight, whatever the commodity might be; and this document, being given or shown to the parties, completely sanctioned the bargain and served as an official certification of the transaction. The same custom is still retained by the Baladi Egyptians in the scales of the public kabbaneh who measure and certify the accuracy of the weights, which are returned in writing upon the application of the parties.